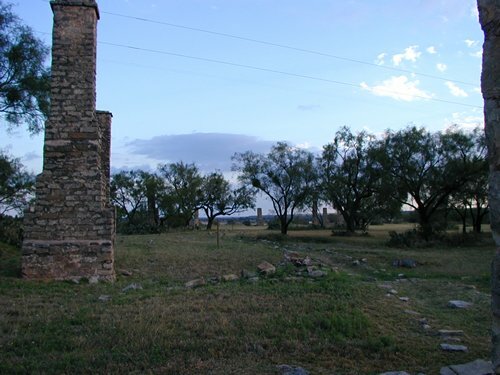 Built in the 1850s as one of the second line of forts to protect the pioneers, it was also designed to protect gold-seekers who were passing through Comanche land on their way to California. In 1849 Capt. 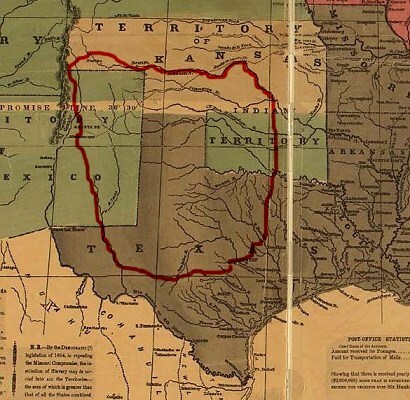 Randolph B. Marcy had been sent to find the best route through a region that was referred to as �Comancher�a.� (See map) The foundations of Fort Phantom Hill were built on Marcy's recommendation. Five companies of the Fifth Infantry (Lt. Col. John J. Abercrombie, commanding) arrived on the Clear Fork of the Brazos in the Fall of 1851 to begin construction. A second fort on Pecan Bayou (now in Coleman County) was planned, but was changed to the Clear Fork where it joined Elm Creek. The change brought about immediate hardship, mainly due to a shortage of water and timber. When a source of building stone was located two miles south along Elm Creek a quarry was established. Timber was hauled in from 40 miles away. 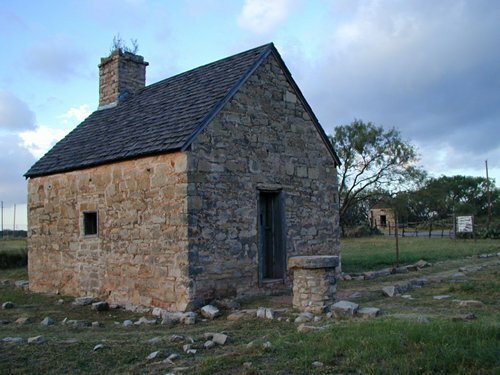 Quarters for the enlisted ranks and outbuildings were of primitive jacal construction, although all buildings had stone chimneys. 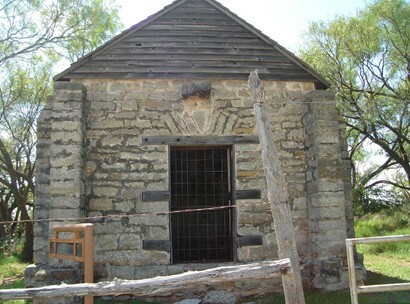 The only completely stone buildings were the powder magazine, storehouse and jail. Officially, the army had the base listed as "Post on the Clear Fork of the Brazos." The odd name is said come from an optical illusion. The fort seems to jut up from the plains when seen from a distance, but close up, the land levels out and the elevation disappears � phantom-like. The barely flowing waters of Elm Creek and the brackish waters of the Clear Fork made duty here miserable. An 80 foot well was dug, but even this source was unreliable. Wagons hauled in water from a four-mile distant spring. 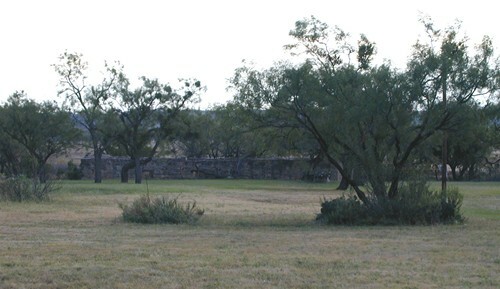 Having no Cavalry to confront the mounted Comanche, the garrison kept to itself, content to occupy the site. They did �meet� other tribes passing through, including the peaceful Wichitas, Lipans, Kickapoos, and Kiowas. Delaware Indians served the post as guides and scouts. Four of the original five companies who had built the fort were withdrawn by 1853 and the remaining troops were bolstered by a company of the Second Dragoons. The post was abandoned in early April 1854 � after a brief span of less than four years. Shortly after abandonment, the fort burned to the ground. There was no shortage of speculation as to who burned it but historians have been unable to conclusively assign the blame. A few remaining buildings were restored in 1858 to be a stage stop for the Butterfield Stage Company. 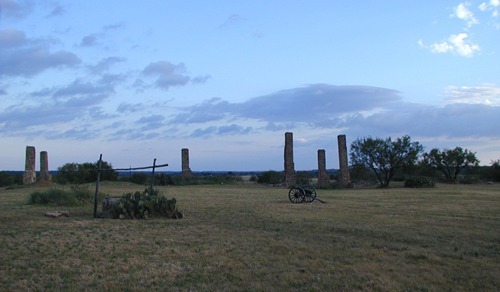 During the Civil War, the fort site was visited by roaming Ranger companies and some units of the Frontier Battalion used it as a base of operations. It became a sub-post of Fort Griffin in the early 1870s and elements of Mackenzie's raiders launched attacks against Indian foes in early 1872. When the Indian threat was extinguished, a small town came into being in the mid 1870s that catered to buffalo hunters. With a 1880 population of over 500 people, the town was made the county seat of Jones County in the spring of 1881 but lost the title (to Anson) that November. The Texas and Pacific Railroad bypassed Fort Phantom in 1882, choosing the southern route through Abilene instead. 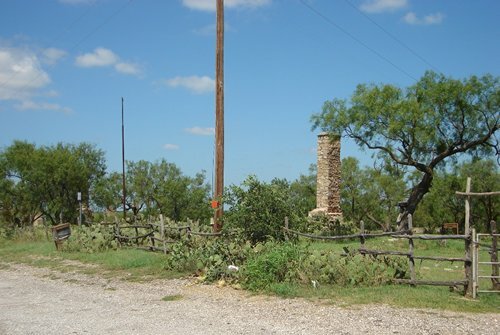 Fort Phantom became a ghost of its former self � with only a hotel, blacksmith and saloon to retain its status as a town. Now on private property, the fort remains on the historic Forts Trail due to the generosity of the land owners. Ironically, the water shortages that plagued the fort�s builders and early residents no longer exist. Today a huge manmade reservoir just south of the fort (and named after it) supplies water for 100,000 people in both Jones and Taylor Counties. 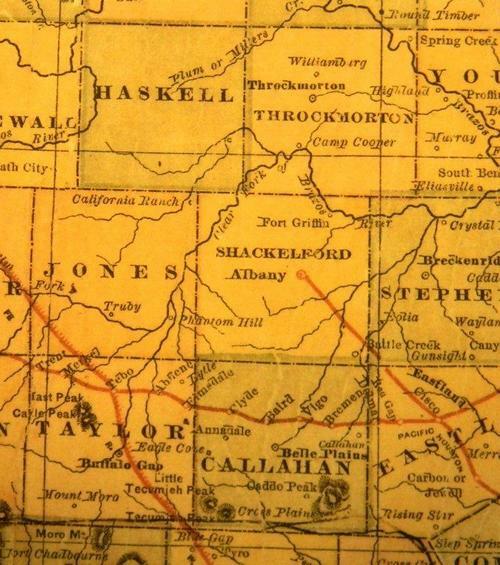 1882 map showing Jones County with Truby & "Phantom Hill"